This is a multiplayer shooting game. Choose your team, buy weapons, armor upgrades and camouflages. You and your crew need to succeed all maps with best score. Kill all the enemies and make sure you stay alive as long as you can a help your teammates. 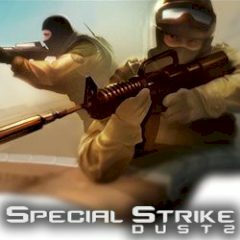 If you are a fan of Counter Strike, one of the most popular online shooting games ever you should try this amazing game, made by g55 made in the best traditions of the shooing games. Your mission is simple – you have to kill all the enemies, before they will kill you and your teammates. The work of warrior is not easy, but is very useful in the war missions. You can choose yourself with tactics you should in different situations. You can use few weapons for it. You should have to use all your abilities of warrior to not die and help you teammates to win. Are you skilled enough for this war challenge? Take your weapons and show everyone who you are. And don't forget about your teammates who need a strong and brave brother in arm to win.